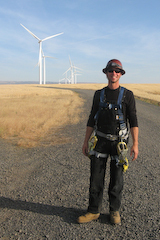 Jim started teaching for Columbia Gorge Community College (CGCC) in Fall 2008 in the Renewable Energy Technology (RET) program, the predecessor to the current Electro-Mechanical Technology (EM-Tech) program. He has taught the basic electronics series, hydraulics, digital electronics series, introduction to wind energy, and the balance of plant/power generation classes. He has a Bachelor of Science in Electrical Engineering from Clarkson University in Potsdam, NY. He has worked as an electrical engineer for IBM, Hyundai, ADE Semiconductor, and GE Wind. Additionally, Jim served in the US Army as a Captain in the 4th Infantry Division. He is NABCEP certified for Basic PV and has produced a number of popular instructional videos on YouTube to supplement his lectures and labs. He sincerely believes energy independence through development of renewable energy sources is the correct course for our nation's future and actively promotes and supports development of renewable energy projects in the Pacific Northwest like the Whistling Ridge Energy Project in Skamania County.